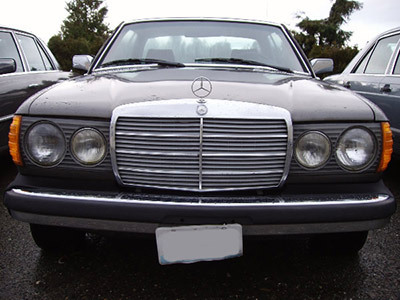 The U.S. 123 may be the most recognizable chassis from the front end. It is the only chassis that used a large round headlamp and a smaller round fog light mounted horizontally. If you have flat glass across the bulbs then you have European headlights installed. This front end design remained unchanged during full production run. The 123 chassis was built with sedan, coupe and wagon bodies. The sedan was introduced first in 1977, a 2 door coupe was added in 1978, and a five door station wagon entered the market in 1979. Each body came with both diesel and gas engines, although the gasoline wagon was only availabe in Europe. All variations remained in production until the end of 1985.